What’s a party without a dance floor? Make your next wedding, birthday party or social event memorable with a dance floor–even if your venue doesn’t provide one. KCK Entertainment is your source for all party and event rentals, including dance floors. You can make your next event even more memorable with an exclusive dance floor from KCK Entertainment, too. 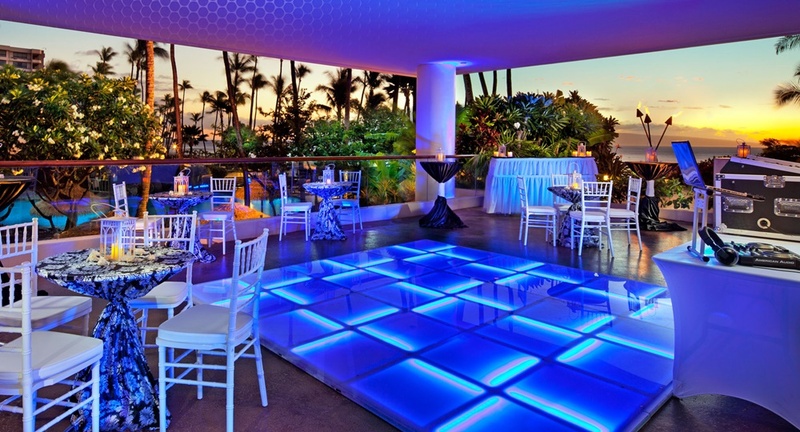 KCK Entertainment is excited to offer Maui’s only LED dance floor rental! Available in various sizes from 8 square feet to 24 sq/ft, our amazing LED dance floors offer over 16 million colors! Create a variety of patterns and effects from a fully programmable control. KCK Entertainment as provided event rentals at thousands of weddings, parties and conventions. You can trust us to ensure “Detailed Service with an Aloha Touch” for all of your event rental needs. Give us a call today at (808) 206-5905 or use the contact form to secure your dance floor rental, sound system rental, lighting rental, DJ and sound engineer.